Monte Plata, Dominican Republic. – In order to furtherreduce water-borne illnesses, the Batey Relief Alliance (BRA) will complementits water purification program with distribution of household cleaning andhygiene products aimed at reducing the high prevalence of water-related skininfections and irritations among 3,200 families living in 15 batey communities(Cinco Casas, La Jagua, El Bosque, Luisa Prieta, Luisa Blanca, Cruce de Mela,Triple Ozama, Fria I, Fria II, La Cerca, Cruce Elmurth, Guasumita, La Mina,Antonci and Payabo) of the Monte Plata province. These products, which include various lotions, shampoo,toothbrushes, toothpastes, soaps, diapers, and more, address the lack ofpersonal care products available to impoverished communities to maintain cleanhygiene. Household products such as detergents, paper towel cleaners, toiletpapers and disinfectants are also available in quantities not found in therural areas. “In collaboration with our donation partner, Matthew 25:Ministries, we are pleased that we could help provide personal care andcleaning products in these communities. We hope that these products will help improve the lives of those livingin the bateyes,” said Claude Zukowski, P&amp;G Global Disaster ReliefCoordinator. BRA will not only distribute the care products, 50 of itscommunity health promoters will are also on the ground educating localresidents about the importance of maintaining proper household and personalhygiene in order to prevent illness. 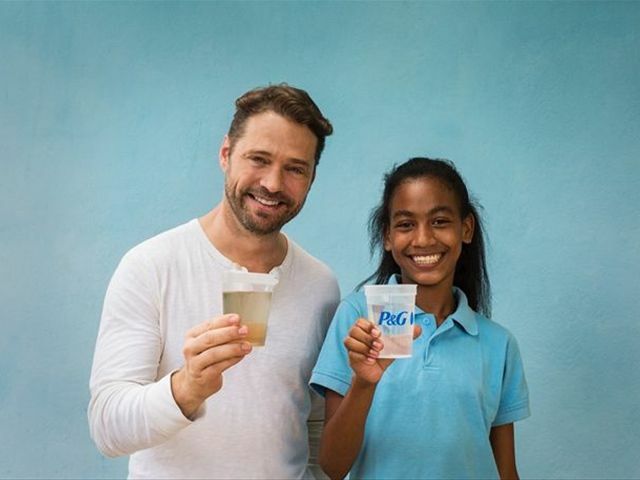 “BRA and P&amp;G hope that providing thesecritical products to the community will add another angle of treatment to an alreadyholistic program,” said Maria Virtudes Berroa, BRA’s Executive Director. Emphasis is also placed on care of children, pregnant womenand people living with HIV who face an increased risk of illness. Mothers aretaught best practices in hygiene for their young children and are encouraged tovisit BRA Medical Center for full pre-natal and pediatric care. “So far, thecare products and water purifier sachets have received an overwhelming positiveresponse from the community, with families visiting the BRA Medical Center toreceive their complete wellness kits,” added Ms. Berroa. Since its inception in 2014, under a Clinton GlobalInitiative (CGI) Commitment to Action, the BRA/P&amp;G’s CSDW aims todistribute 180 million liters of clean drinking water through water packets,creating daily supplies of water for more than 12,000 families living in thosebateyes. Targeted families live in subpar living conditions, which oftencompound the effects of contaminated drinking water and make it harder tomaintain good hygiene. Families are also supported with access to BRA MedicalCenter for quality health and HIV care, micronutrients for children andpregnant/nursing women, and food assistance through the USAID’s Food forPeace-Internal Food Relief Partnership Food Assistance Program.